Have you seen these messages around town this summer? The Ardsley SAYF Coalition developed these posters, as well as a postcard mailing in June to reinforce our message to Ardsley parents. 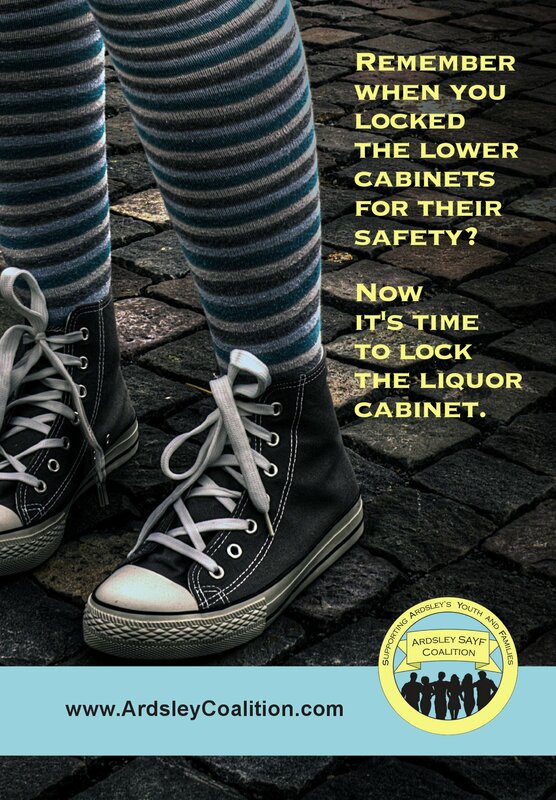 It’s important to be aware of what your adolescents are doing, to make sure that you discuss with them the dangers of underage drinking, and to be responsible, by doing your best to keep alcohol from being accessible to your children. 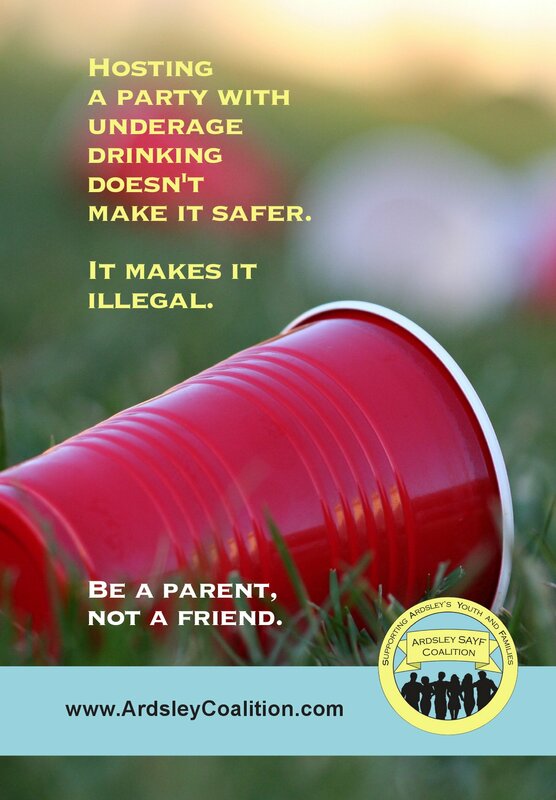 Remember, parents who talk to their kids about the dangers of underage drinking and drug use, have set clear rules, and follow through on consequences are much less likely to have children who use alcohol and illicit drugs. • Be sure your children know that tobacco, alcohol, and drugs are addictive. • Know where your children are and who they are with. Get to know your children’s friends and their parents. • Be honest with your children if asked. Share your experiences— including your mistakes as well as the consequences of your mistakes. • Help your children build self-esteem and confidence. • Discuss problems and involve your children in problem-solving. • Set and enforce clear rules against drug, alcohol, and tobacco use in the home. • Tell your children how disappointed you would be if they used these substances. • Be at home at key times for key events. Become involved in your children’s schooling and activities. • Educate your children about images that glamorize smoking, drinking, and substance use in advertising, television, and films. • Keep your children active and involved in positive things like volunteering and fitness. • Learn the signs of alcohol and drug abuse and be alert for changes in behavior or appearance. • Be aware of the example you provide. Look for the posters along the main roads in Ardsley, at the bus shelters, and be sure to keep our children SAYF!